Back in 2014, I had the opportunity at Jeroen Raes lab (VIB-KU Leuven, Belgium) to start a PhD project on the microbiota-gut-brain axis (MGB). The notion that metabolites synthesized by microorganisms could interfere with the functioning of our brain sounded especially intriguing. The MGB is a fascinating topic, but published research studies are still scarce, and a great deal of them are performed in rodent models where translation to humans has been far from straightforward. Being a microbiota-focused lab, we believed the gut microbiome could be examined in more detail and analyses targeted in better ways to provide insights into this bidirectional interaction. Importantly, a tool was lacking to interpret metagenomic data in the MGB context, i.e. to assess the potential of microbial communities to metabolise neuroactive compounds. While there are reliable and extensive databases (such as KEGG) to translate gene content into metabolic pathways, it can be difficult to 1) select reactions that Bacteria and Archaea are capable of performing in the gut environment, and 2) to find recently described pathways. Therefore, we set out to develop a set of manually-curated metabolic modules. Luckily Sara and Gwen, a postdoc and a staff-scientist in the lab, and I had experience building such a set, after assembling one focused on the microbial food chain in the human gut (Vieira-Silva et al, Nature Microbiology 2016). 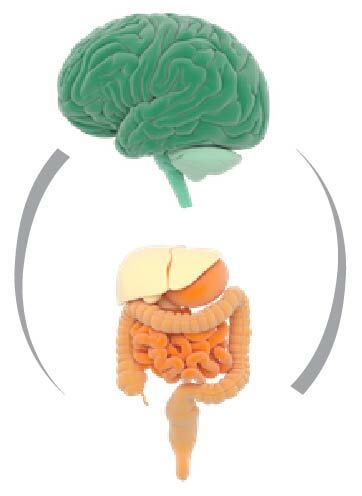 Through exhaustive literature and database review, we built the gut-brain modules (GBMs): a framework that captures the known microbial pathways for synthesis and degradation of neurochemicals by members of the human gut microbiota, making interpretation of metagenomic data in the MGB context much more straightforward. Once the tool was ready, we started by running it in a set of genomes of sequenced microorganisms isolated from the human gut and created a first catalogue of neuroactive potential of gut prokaryotes. Interestingly, by comparing GBM distribution in these genomes to free-living microorganisms, we found that some functions, including all known pathways for synthesis of the inhibitory neurotransmitter GABA, were significantly more prevalent in gut-associated microorganisms – suggesting a potential role and advantage for interaction with the human host. Next, we analysed the metagenomic data of the Flemish Gut Flora Project (Belgium) to find which faecal microbial taxa and functions (GBMs) were associated with diagnosis of depression and reports of quality of life, with validation on an independent dataset (LifeLines DEEP, Netherlands). We identified several taxa, including butyrate producing bacteria, consistently depleted in depression and associated with higher quality of life indicators. We also found that antidepressant usage was an important source of variation, which emphasizes the importance of taking confounders into account in MGB studies. The GBM framework also revealed that DOPAC, a metabolite of the neurotransmitter dopamine, was consistently positively associated with mental quality of life, and indicated a potential role of microbial GABA production in depression. We are excited to have presented population-scale evidence for microbiome links to mental health, while emphasizing confounder importance. While acknowledging that the approach in this study cannot test for causality nor directionality of the MGB interactions identified, we aimed at presenting a panel of solid associations, considering the statistical pitfalls of microbiome data (compositionality and sparsity) and microbiome confounders (e.g. gastrointestinal transit time). 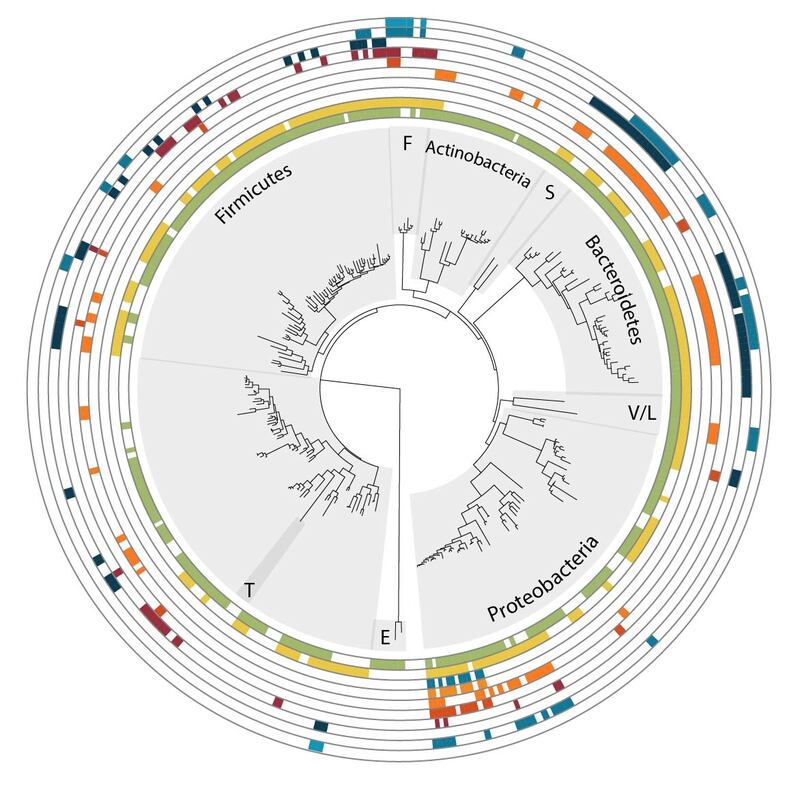 We are pleased to release to the research community a framework that we believe will facilitate interpretation of metagenomic data in future MGB studies, thereby contributing to further advances.